Brook Street Chapel is a Grade I heritage site. Elizabeth Gaskell, husband William and two daughters are buried in the graveyard. Costumed talks, tours and readings will be taking place and artefacts from the Whitfield Collection will be displayed. 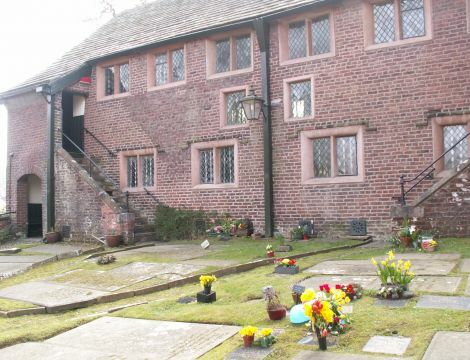 Brook Street Heritage site comprises a Grade I listed Chapel built in 1687 – Knutsford’s oldest place of worship – and exhibition rooms featuring Elizabeth Gaskell’s early years in Knutsford; how they influenced her writing and her relationship with the families from the stately homes of Cheshire including Tabley House and Tatton Park. The Gaskell room is set out as an early Victorian parlour with artefacts, costumes, books and information boards and a Dolls’ House representing Elizabeth’s home with her Aunt Lumb in Knutsford. The Chalice Room has information on the history of the chapel and a brief history of Unitarianism. There are also examples of famous Unitarians. The graves of Elizabeth and William Gaskell and two daughters are in the graveyard amid other well-known people. Lovely tranquil gardens. Talks, tours and costumed Gaskell readings will be taking place during opening hours and a video about the life of Elizabeth Gaskell can be viewed. On Sunday 9 September, from 11am until noon, there will be a special Elizabeth Gaskell-themed service in the Chapel. A lift in the chapel hall goes from ground level to the first floor exhibition. A level path leads to the chapel. Cars can park outside Adams Hill entrance so that disabled passengers can alight. Artefacts from the Whitfield Collection, Elizabeth Gaskell’s private collection, will be on display. On Sunday 9 September, there will be a special Elizabeth Gaskell-themed service in the Chapel from 11am until noon. Brook Street Heritage Site is midway down Adams Hill, opposite Knutsford Railway station. At the bottom of the hill is an Aldi supermarket; at the top of hill are traffic lights and beyond them, Booths Supermarket.